Last month I was the lucky winner of a Kraftshop monogrammed necklace giveaway hosted by Chris of Chubbette Tales...Life After Spanx! I wanted to win this giveaway so bad and the competition was fierce (my Weekend Update co-hosts Dana of Five30Three and Sami of Sami's Shenanigans and I were trash talking about who would win...of course ME!) and I pulled through! As a result, I am the proud owner of this gorgeous necklace. I love my pendant! It's a sterling silver initial 1" and the size is perfect. Not overpowering at all. But if you prefer larger necklaces, the company offers several sizes and metals to choose from. 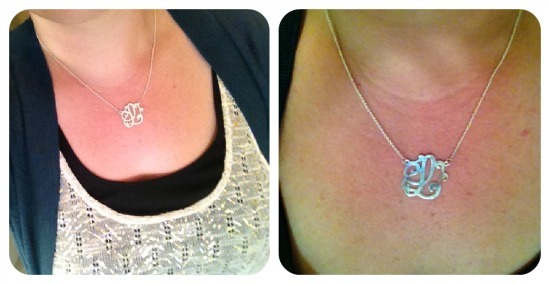 And while my pendant is a single initial, you can also purchase a full, three letter monogram or full names. Want a ring or bracelet? They offer those too at Kraftshop! In addition to the beautiful necklace, Chris, being the sweetest thing ever, sent me some other items for my birthday! 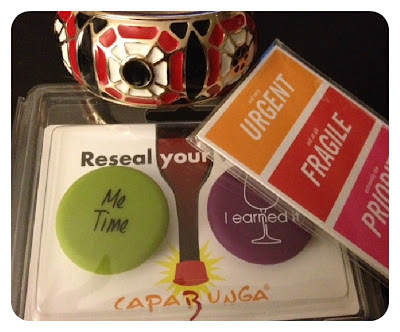 Check out the adorable bangle, wine stoppers, and envelope stickers she got me. Super cute right? So head over to Chubbette Tales and Kraftshop when you get a chance. You won't be disappointed with either site! Nothing like a little "weekend update" friendly competition. You were a fierce competitor and if I was going to lose to anyone, I'm glad it was you. Your necklace looks awesome! I adore Chris and anyone who doesn't follow her blog is a total fool! i'm in love with that necklace - i want one! Love the necklaces. So pretty and unique. lucky lucky you!!!! i love the necklace! I love the necklace! And wear sunscreen dammit! Pshhh I'm still bitter ;) Just kidding! I love each and every one of you.. even Dana! Cuuuute! 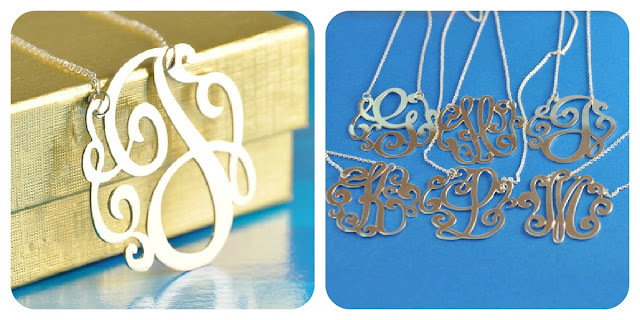 I've always wanted a monogram necklace like this, but "C" is such an ugly letter. Haha! I think the size is perfect! I was wondering who the heck won this giveaway! I just knew it was going to me!!! Well, I am glad at least a friend won! It's so cute and Chris is the sweetest!! So glad you love it and hope you're enjoying your other goodies! The necklace is super cute and how nice that she sent you extras because it was your bday! Hi, we love your style and blog very much! Recently i bought a gold monogram earrings from GetPersonalizedJewelry, the style is very beautiful with high quality. I think you might like it. I think you might like it because it fits your outfit and style!